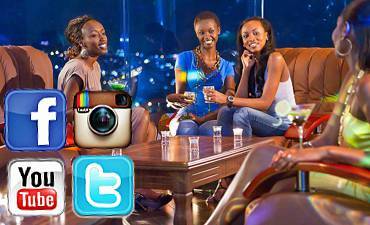 Do You Need Ideas For Your Rwanda Trip? 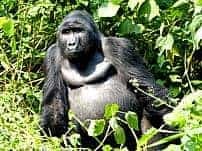 Scroll Down For Details..
Review diverse Rwanda safari experiences available from gorilla and primate treks, photographic, family and romantic honeymoons tours to hiking trails, birdwatching, private, custom and luxury trips. 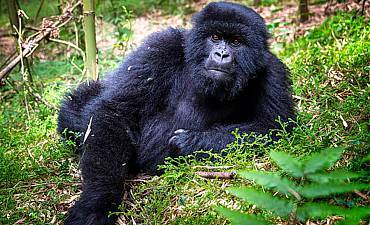 Review the opportunity to see the endangered mountain gorillas and golden monkeys of Volcanoes National Park and other primates like chimpanzees and colobus monkeys of Nyungwe Forest National Park. 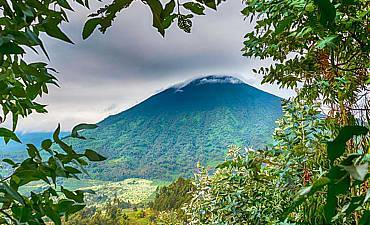 The towering forest mountains of Volcanoes National Park (Parc National des Volcans) are inhabited by endangered mountain gorillas, other primates and fauna, including more than 178 species of birds. 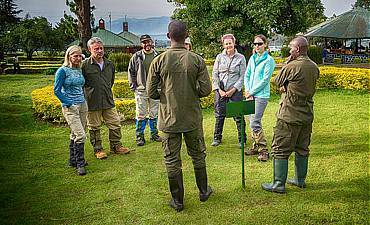 Review suggested itineraries by AfricanMecca to get ideas for your discerning holiday in Rwanda, from a gorilla trek, cultural tour, wilderness safari, historical visits, lakeside beach rest and more. 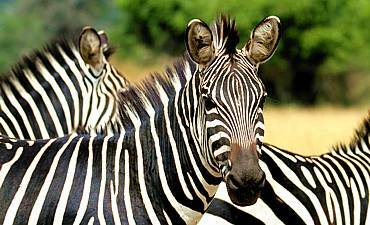 A small, enchanting country in the heart of Africa with an area of just 26,338 square kilometers and a surprisingly pleasant, temperate climate for unique wildlife viewing. This is Rwanda. Despite being located so close to the equator, Rwanda sits at an elevation that keeps it cool throughout the year and makes it an ideal destination for an adventure vacation (reasons to visit). 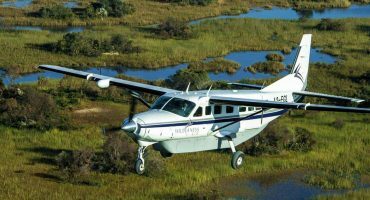 As you arrive in Rwanda, by air or the scenic overland route, you will be struck by the beauty of the rolling green terrain that has earned the country the nickname “The Land Of A Thousand Hills.” When you begin planning your tour of this amazing country, you’ll learn that it has distinctive wonders waiting for you to discover. Most travelers land at the international airport in the capital city, Kigali, and spend time here before making their way to the country’s distinctive parks and reserves, each inhabited by unique species of flora and fauna. 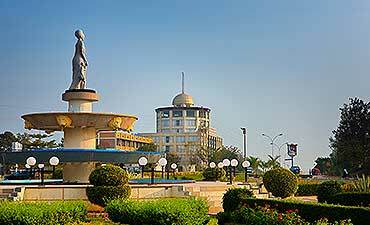 A thriving, bustling city, Kigali represents the spirit of rejuvenation and rebirth that is characteristic of Rwanda. During your city day tour, visit the museum and art centers for a glimpse of the creative talents of Rwanda’s young people. It’s an exciting mishmash of the old and the new. Also be sure to take part in the music and dance forms displayed at these centers. Enjoy your introduction to the incredible ancient culture of the three tribal communities that have lived in a symbiotic society for centuries. Trace the arrival of the region’s Batutsi and Bahutu clans, and learn how they assimilated with the local Batwa to create a shared society. Spend time visiting the memorial and shrines around Kigali built in memory of the victims of the 1994 genocide. The world is well aware of the impact of the adverse media; see for yourself the effects of dangerous political propaganda as you come to understand how its fallout can destroy centuries-old peace and harmony. Kigali also hosts the Museum of Natural History (Kandt House). Venture back to the country’s colonial past or catch a glimpse into Rwanda’s natural treasures — there’s something for everyone to enjoy. Visiting Kigali, you’ll revel in stunning bursts of color in places like the Caplaki Handicrafts Cooperative, where you can buy holiday mementos, including exquisite handicrafts, nesting baskets, carved wooden relics, painted pots and ceramics, whimsical tribal masks, and so much more. You must check out the gorgeous printed fabrics for sale in tiny stores, as well as sample the local cuisine. Try brochettes, lip-smacking treats on little sticks, or perhaps the traditional dishes of Rwanda, such as nyama choma (roasted goat meat) and ibirayi (crispy fried potatoes). Sip on delicious banana beer or try the local high-grade coffee and tea. After the displays have whetted your appetite for more Rwandan sights and sounds, take a multi-day trip out to the parks and reserves. Rwanda is home to an astonishing 14 species of primates, some of which are on the endangered list and not found anywhere else in the world. Its location on the Albertine Rift creates the ideal habitat for some 650 species of birds, making it a veritable heaven for bird lovers. You will also find 402 species of mammals and 293 varieties of amphibians and reptiles. 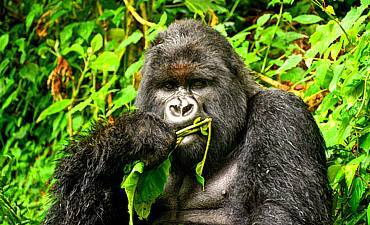 Travel out to Volcanoes National Park for the exhilarating experience of spending time with the magnificent mountain gorillas of Rwanda, found primarily in the Virunga Mountains. While being able to spend time watching a gorilla family is an amazing adventure, so is the journey to locate them. You will be trekking through Eden-like forests where the song calls of birds and the melody of waterfalls accompany you. Keep an eye out for smaller animals darting around in the undergrowth as you walk. 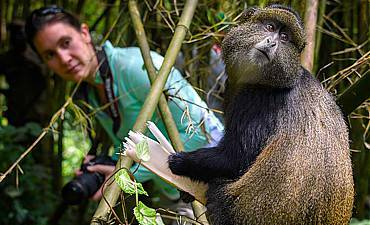 Volcanoes National Park offers yet another unforgettable experience on your active holiday: the opportunity to view golden monkeys, another rare species of primate. 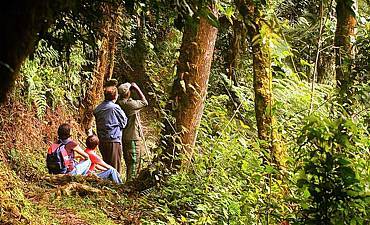 You could also go hike up Mount Bisoke or Mount Karisimbi for breathtaking views of the lakes and landscape of the reserve, or perhaps go on a pilgrimage to the grave shrine of Dian Fossey, the remarkable woman who worked for the conservation of the unique Rwandan mountain gorillas. 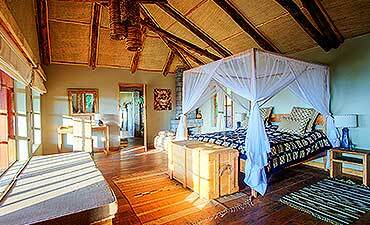 Visit Iby’lwacu Village and relish the cultural opportunity to see how the local tribe lives. It has been preserved as a living relic with songs, dances, craft-making, cuisine, and medicine making, just as it existed centuries ago. Banda Village, close to Nyungwe National Park, is another location where you can view the lifestyles of Rwandans, whose culture goes back thousands of years. Visit the Nyungwe Forest and experience the sensation of walking on clouds far above the treetops on the Canopy Walkway. The forest also has many other trails that you can follow, each allowing visitors to explore a different thrilling aspect of the forest. Some treks will take you to the wetlands, while others will reward you with breathtaking views of Lake Kivu or the Democratic Republic of Congo in the distance. Yet another trail may offer the opportunity to spend time watching the chimpanzees of the Uwinka and Cyamdungo Forests swing through the trees, an exhilarating and truly memorable primate safari experience. Travel to other sections of the park to encounter grey-cheeked mangabeys, owl-faced monkeys, Dent's monkeys, and red-tailed monkeys, just a few of the beautiful primates of Rwanda. 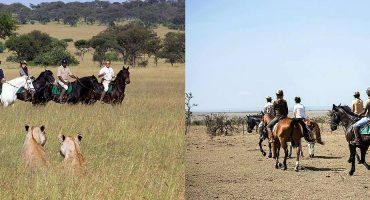 If you can tear yourself away from popular attractions you would like to experience on your tour, then take a safari out to Akagera National Park. This renewed natural paradise now hosts all five of the Big Five of Africa, with lions in reintroduced in 2015 and black rhinos reintroduced in 2017. Go on game drives and explore splendid landscapes that are home to a rich diversity of terrestrial animals and birds. 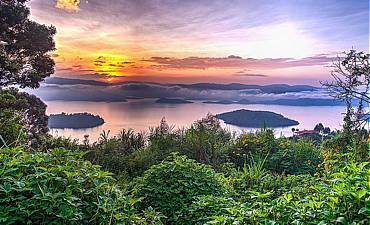 After you have enjoyed your fast-paced, thrilling explorations of Rwanda’s big parks, head to the tranquil environs of Lake Kivu for some rest and recreation. One of Africa’s largest and deepest lakes, it has the distinction of having tiny islets, each of which hosts its own biome with rare flora and fauna. Spend hours sunbathing on the golden beach beside the lake, listening to the birds chirping, or taking the occasional dip. As Kivu has no dangerous inhabitants, like crocodiles and hippos, to watch out for, this is a safe place to swim. Those looking for something more adventurous may enjoy participating in exhilarating water sports such as water-skiing or jet-skiing, or go fishing on the lake. The green beauty of Rwanda and its many attractions makes it a fabulous location to spend your safari vacation in Africa. 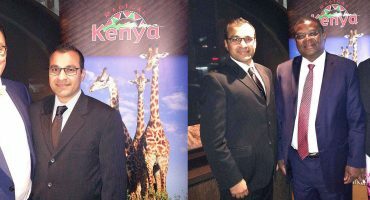 Work with the expert consultants at AfricanMecca Safaris to plan a dream holiday, exploring everything that this fascinating country has to offer.